My fellow blogger and tea lover, Justine from Eclectic Odds n Sods, launched today The Tea Time event. In her own words: “This event is for anything related to the ‘Experience of Tea Time’. Imagine sitting with your friends, what would surround you, what would you drink, what would you eat, what crockery would you use, what might you talk about? Go there and join the Tea Time. Thanks to Justine, I learned that today is also a very special day: Andy Townend’s Birthday! I join Justine and dedicate my first Tea and cakes to him. And lots of happiness! Andy’s passion is photography and writing. Go and check his blog Belgian Streets; although is his birthday, he will be the one gifting you with stunning photos and words. Cheers to Justine for organizing a lovely event that brings us bloggers together; and to Andy, wishing him many happy returns! Photo101 Rehab #5 Half Empty or Half Full? Would like some tea with it? oh my now those look gorgeous but my eyes are drawn to the red one, what is in it? Which one did you eat first? lol and which one was the best? 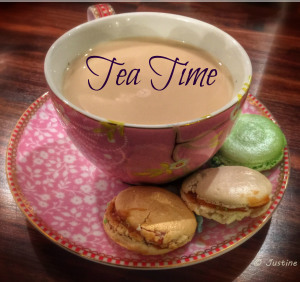 Are you feeling sick now having gorged on them all…grins…seriously lovely post and tribute to Andy, thank you so much for popping by, you are lucky to have such a nice cake shop nearby and I love glass teapots!!! The red one wasn’t the best but surprisingly the green one, which I didn’t expect, as the superstar was supposed to be the chocolate one. 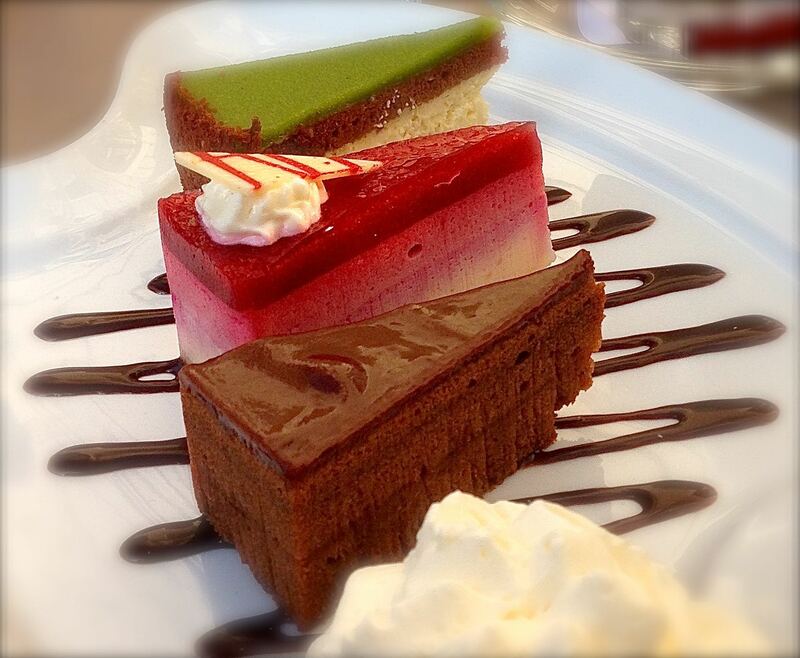 Red one is raspberry cake, the chocolatey is called Sacher (Austrian cake), and the green one is with pistachio. Deli. “These were mini cakes and the photo doesn’t show that” … Very funny, Lucile! I often wonder, when I take food shots for my blog, if they appear bigger or smaller than they really are?!? haha! Funny, isn’t it! I was a bit self-conscious for eating 3 pieces..silly. Eat and enjoy! They do look delicious! Lol; green is the new gold….I never thought that a simple cabbage photo would generate a whole new lingo. And a bit of a cabbage sect mixed with aliens. I should try to bake a cabbage cake…. Well, I may take the challenge and invent a recipe…you will see one soon. Let me consult my kitchen oracle. Esta mañana vi el Evento Tea Time de Justine que me ha parecido muy agradable, y ya he pensado en unirme a él. Me podrías ayudar y explicarme como lo consigo? Mariangeles, lo siento porque yo no respondí antes su mensaje. Veo que encontró solo cómo poner la imagen y el link. Estoy siempre a mano si usted necesita cualquier información. una vez más, lo siento. abrazos. The power of suggestion is strong: now I must make myself a cup of tea! Lovely photograph, and your friend Justine has an appealing idea! Hope you enjoyed your tea and made photos, so you can join next time. Have a good day and thanks for visiting. Well, I cheated and used my Keurig to make tea in a mug: that is probably a violation of tea etiquette. My college daughter is a true tea-drinker, and she is coming home soon. Maybe her arrival will generate an actual pot of tea. I am so happy that we have come to know each other and to save so many converging good times with some lovely people from backgrounds as diverse as East Sheen and ..errrr…Patagonia!! Tea and cake look lovely! What a lovely and elegant idea!! Ps: the photo of the cakes make my mouth water! Wish I had a piece for breakfast today! Yes, I agree. Justine’s idea is great. Don’t believe appearances; I only liked the green cake…so, no loss. 😁😁You can’t judge a book by its cover I suppose!! !